OXFORD, England (CNS) — The newly installed head of one of Africa’s largest archdioceses will vigorously defend democracy and human rights, while also seeking to reconcile political opponents, said church officials in Congo. 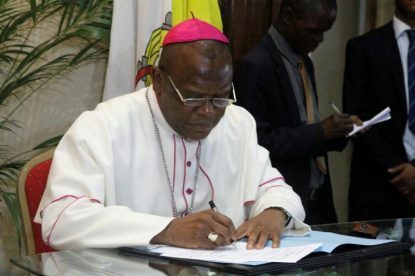 Archbishop Ambongo, vice president of the bishops’ conference, began his ministry as archbishop of Kinshasa in late November, replacing 79-year-old Cardinal Laurent Monsengwo Pasinya, who held the post for 11 years and was a member of the Council of Cardinals advising Pope Francis on reforms. Father Masinganda told Catholic News Service that Archbishop Ambongo, who was installed Nov. 25, would be ready to work with all sides in Congo’s bitter political disputes. “He shows an open spirit and is always ready to calm and unify by considering the views and convictions of others,” Father Masinganda said, adding he hoped political leaders would show a new willingness to cooperate. Father Masinganda said he expected Archbishop Ambongo to gain a similar profile to Cardinal Monsengwo in international church affairs, as well as in contacts with foreign governments. Archbishop Ambongo, who was appointed Nov. 1 after nine months as Kinshasa coadjutor, previously headed Congo’s Mbandaka-Bikoro Archdiocese after serving from 2004 to 2016 as bishop of Bokungu-Ikela and apostolic administrator of Kole. Born the son of a rubber tapper in Boto Jan. 24, 1960, he took final vows as a Capuchin Franciscan in 1987 and was ordained in 1988 after studying moral theology in Rome. He later taught as a Catholic faculty professor in Kinshasa. In 2016, he testified to the International Criminal Court in The Hague on local warlord activities, and he was an architect of a Dec. 31, 2016, church-brokered accord on elections to replace Kabila. He endorsed Catholic protests and condemned police violence when the accord was violated. The Jeune Afrique weekly said Nov. 2 the appointment of “a man of the church who doesn’t mince his words” to the “strategic post” of Kinshasa could be seen as “a message of firmness by the pope” toward the Congo’s rulers. La Prosperite daily said Archbishop Ambongo appeared “aware of God’s favor in his life,” adding that he would “cling tenaciously” to the aim of ending the country’s crisis in line with the “very rigorous” style of Cardinal Monsengwo. “Power is a service — the humble service of others for accomplishing and realizing a complete society,” the archbishop told the 70,000-strong congregation, who included Congolese Prime Minister Bruno Tshibala and senior government and parliamentary officials. If everyone receives and practices the message of humility, “we can really transform our society and make Congo a finer place,” the archbishop added. Father Clement Makiobo, who studied with the archbishop, told France’s Catholic La Croix daily that Archbishop Ambongo had been “passionate about justice and law issues” as a young man, while also expressing “direct opposition” to the Mobutu Sese Seko, who ruled from 1965 to 1997. “His appointment fulfills a life of commitment to human dignity, in a country where the church remains the only institution able to face up to power,” Father Makiobo said. The World Almanac lists 50 percent of Congo’s more than 83.3 million people as Catholics. It has more Catholics than any other African nation. With presidential elections scheduled Dec. 23, tensions are high. Kabila, who took office in January 2001, is expected to be defeated. The United Nations says violence by armed groups left 4.5 million people displaced and a fifth of the nation’s inhabitants needing basic assistance.